High Capacity, High efficiency, Low Amp Draw Rotary Compressor, 2 stage air cooling with “Air to Air” heat exchange, High Static Backward Curved Fan, Extra long power cord complete with A GFI Plug, Temperature Sensitive Defrost control for optimum performance, Effective, reverse cycle defrosting feature which automatically melts away frost buildup providing effective operation at low ambient temperatures, Rugged, epoxy powder-coated steel chassis and housing, Washable Air Filter, Integral Condensate Pump with Purge Feature. 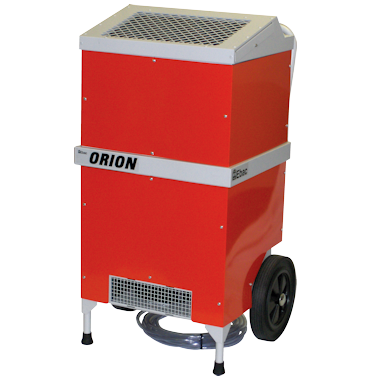 The EIPL Orion Dehumidifier is a rugged, yet mobile, piece of equipment that will operate under extreme conditions and pull large amounts of moisture from the air. The Orion incorporates an “Air To Air” Heat Exchange which provides a secondary level of pre-cooling. The high capacity backward curved fan will maximize air delivery over long distances. Whenever there is a need for fast dependable, energy-efficient drying, EIPL can provide the answer. The high efficiency Rotary compressor ensures the maximum extraction with the lowest running costs.